You have landed your dream job and are ready to say goodbye to your current employer. But before you go, you have some decisions to make about your 401(k). While there may be some guidance from human resources, what you do with your retirement savings when you change jobs is generally up to you. So what happens to your 401k plan when you leave a job? 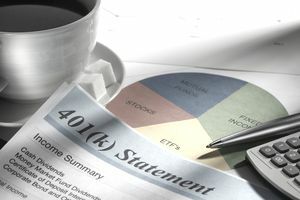 If you have an employer-sponsored 401(k), you will likely be faced with four options when you leave your job: stay in the existing employer’s plan, move the money to a new employer’s plan, move the money to a self-directed retirement account (known as a rollover IRA), or cash out. Here are things to consider with each option. Many companies will let former employees stay invested in their 401(k) plans indefinitely if there is at least $5,000 in the plan. In a survey of nearly 1,100 Fidelity plan participants, nearly one-third of respondents stayed in a former employer’s 401(k) for 120 days or longer because they were unsure of what else to do. Unless your former employer’s plan has outstanding investment options or unique benefits, however, leaving your 401(k) behind rarely makes sense. According to the Bureau of Labor Statistics, the average US worker changes jobs 11 times throughout a career. Leave a 401(k) plan behind at each and, come retirement, you will have to sort through a trail of plans to figure out what you have. In the meantime, you risk overpaying for too many unnecessary investments. To be sure, if you have been through a layoff and are not sure of your next move, keeping your 401(k) funds with a former employer may make sense in the short-term. If you are starting a new job that offers a 401(k) plan, you may have the option to bring your old plan over and consolidate it with the new one without taking a tax hit. If the new plan has great investment options, this could be a great move. You keep your retirement funds growing in one place, which makes it easier to manage over time. Plus, if your new employer offers 401(k) plan loans, there is a more substantial balance to borrow against. Another option is to open what is known as a rollover IRA, a retirement account that exists to consolidate other retirement accounts in one place. It’s like a basket into which you can throw all of your old 401(k)s. Money moved into a rollover IRA remains tax-deferred for retirement, and you can invest it in any way you choose. Within a rollover IRA, savers have access to countless investment options, including stocks, bonds, mutual funds, and real estate investment trusts. If that sounds overwhelming, you could instead opt for a lifecycle fund that chooses investments for you according to your target retirement date. If there is one option to generally avoid, it is pulling your 401(k) money out altogether. Even if it seems like easy money or gift at a time when cash is sorely needed, you will likely regret it later. That’s because if you take a distribution before you reach the retirement age of 59 ½, you will owe federal income tax on the money, plus any applicable state and local taxes. On top of that, you will likely also be charged a 10 percent penalty fee for early withdrawal. (Although there are some cases in which the penalty fee may be waived.) It’s a high price to pay, and it jeopardizes your long-term retirement savings. In other words, this option creates more money problems than it solves. There is no one right 401(k) move for everyone, but by exploring your options, you can determine what is right for you. Consider your choices carefully before making a decision, and talk to human resources representatives and plan administrators at your old job and your new job. Most importantly, if you do decide to move the money from one plan to another, pay attention to asset transfer rules to avoid missing a deadline or creating an unexpected taxable distribution.